More, you say? You want more than this? Well, we've got more! For what carnival convention would be complete without a genuine master of fire? Watch Fast & Furryious as he tames the wild flames and breaths fire in the early night by the poolside. Fast & Furryious will be holding performances each evening of the con, with each performance slightly different than the last. You'll definitely want to come to each performance. The ever popular Furry Drama Show will also be returning to Fangcon with a host of new performances. Come and enjoy the music, comedy, and joy of this great show. If you'd like to add your performance to The Furry Drama Show, it's not too late! Just contact them through their FA page. Once again, Tiger Haven will be joining us as our charity of choice. We hope all of you will go by their table to learn more about their great works. To help support them we will be hosting a charity auction. A variety of items are being gathered from the four corners of the world to be claimed by the furry community. If you have an item you'd like to donate to the charity to help support the kitties, please bring it with you to the con. We'll have a place set up for last minute entries. Remember, the Fangcon carnival will only be in town for one weekend. This will be an event you won't want to miss. Rooms will fill up fast! 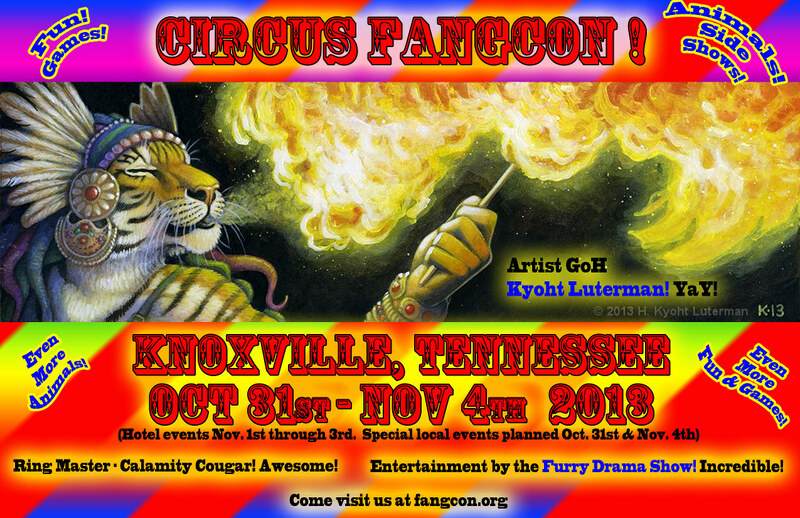 Just call our hotel at (865) 693-1011 and be sure to mention the code FCG to get our special con rate. Every room booked helps support the con. If you're looking for a roommate, someone to travel with, or just trying to arrange a meetup, then be sure to stop by the Fangcon mailing list. Other areas to find us all at are on Fur Affinity, Twitter and Facebook (main page and open discussion group). Kyoht, our wonderful GoH, will be selling in the dealers den along with a variety of other crafters. Other big names in the fandom, such as Rhubarb The Bear and Buck Reilly aka Husky in Denial are making plans to attend. We want to add your name to the list of attendees this year.